As I somewhat expected, there were plenty of prayers and bible verses. As I feared (and really should have known better) there was no bar. But there was a cake. 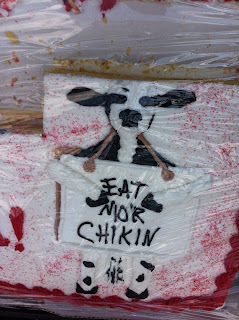 And the cake admonished the assembled employees and guests to "eat mor chickin". 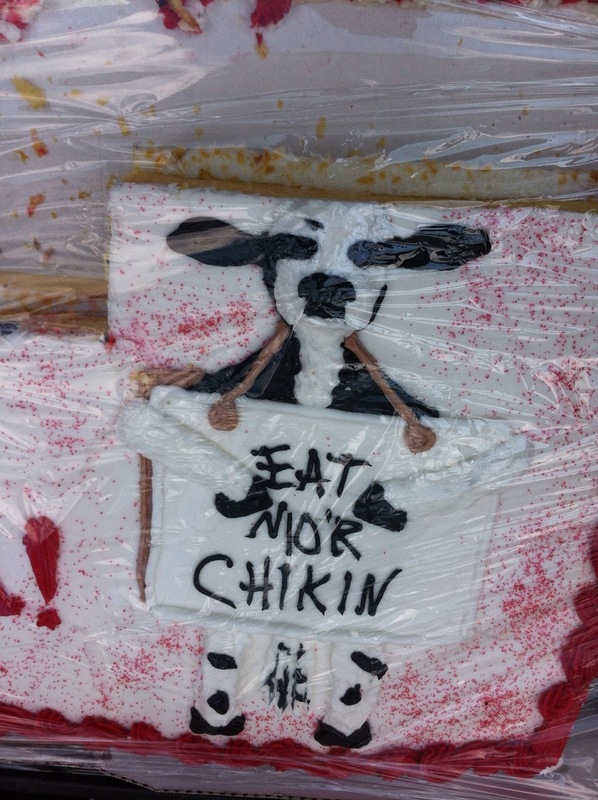 It turns out the cake was cruelly taunting us, as scouring every buffet table turned up not a single nugget. All I could find was fresh fruits and veggies and a selection of cheeses. I ate the cake. My friend seemed so happy to see me there. We've had this discussion many times and she knows my feelings about her employer. I think she was looking forward to the opportunity to show me first-hand what an awesome place this is to work. And it is a very impressive work environment. Kind of like working for Google. But whereas Google's mission statement is "don't be evil", the mission here is to "glorify God", with a narrow Evangelical Southern Baptist interpretation of what that means. Part office, part museum and part Christian resort, my friend gave me the grand tour. The workout facilities rivaled the best commercial gyms I've seen, with full time trainers and nutritionists on staff. The massive cafeteria offered nearly any choice imaginable, all free of charge to employees. More fresh fruits, a large salad bar, even a brick pizza oven. Yet I still didn't see any fried chicken or waffle fries. I'm guessing this might be thanks to the pesky, aforementioned nutritionists. So did I gain any insight which opened my mind? Has my opinion changed at all? Not really. The carillon bells playing church music in the parking lot creeped me out. The Republican National Convention hairstyles (and overall vibe) were unnerving. The constant religious references will never feel right to me in any place of business. The need to call attention to the extent of each person's involvement in their church and/or missionary activity struck me as forced, and gives the distinct impression that career opportunities here are tied to how employees spend their "free" time. As speaker after speaker took the dais, their obliviousness to the possibility of other points of view made it clear to me that these folks rarely wander far from their echo chamber. For example, an opening joke mocking gun control at an employee function would put any normal HR manager in a cold sweat. Not so here. An anecdote alluding to Grandmother's racism? It's funny 'cause that's how grandmothers were, bless their hearts. Keep in mind my perspective isn't just that of a moderately liberal gay man, I'm also decidedly not religious. But I'm not anti-religious by any means. I love that our country upholds freedom of thought, of conscience and of religion. I believe private companies should be able to espouse the religious values of their owners, as long as no one's constitutional rights are violated, employee or consumer. I admire a company that strives to do good in its community and in the world. I admire a company that puts people ahead of profits. I'd be happy if every company had a stated mission of making the world a better place. But the fact is, even if 99% of your philanthropical resources are used for good, that 1% being used to hurt people will diminish your efforts disproportionally. I love my dear friend. I respect her career choice and I admire how well she does her job. I feel sympathy for the conflicted position her company's owners sometimes put her in. I don't want want to see this place put out of business, although that's not likely to happen anytime soon. It's obviously doing just fine without my support. But values and convictions are not the sole domain of bible-thumpers. Until things change, I choose to spend my fried-food money elsewhere. Gay Marriage bothers them, but a man in a huge codpiece with a trusty ward does not? Another great blog post Patrick. But Will It Help Me Proofread?